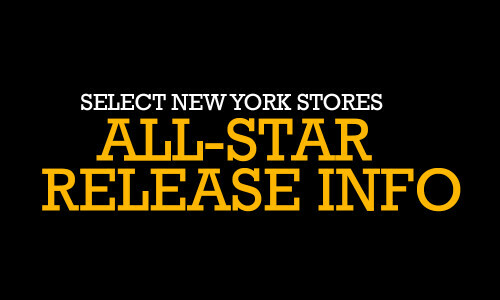 Due to heightened excitement for the upcoming Men’s and Grade School All-Star releases, select New York City Footaction locations will have specific procedures in order to purchase the below releases. Please read the following information carefully. You can only reserve a pair for the stores listed below, if you pick up a ticket at Footaction @ 543 Fulton Street in Brooklyn on Saturday, February 7th (8:00 a.m. – 8:00 p.m.) and Sunday, February 8th (8:00 a.m. – 6:00 p.m.). For additional All-Star release details, please visit the Footaction Release Locator. If you receive a ticket, you must be at the store you selected between 8:00 a.m. – 6:00 p.m. local time on the release day to purchase your pre-selected size. You must have the ticket and show a valid photo ID that matches the name on the list in order to purchase the shoe. The Nike Air Foamposite One ‘Mirror’ (On Sale 2/15) will follow a sweepstakes procedure. For details, please visit the Footaction Release Locator. Customers can select no more than three of the All-Star product listed above, with only one pair per style, in a single transaction, based on product availability. Any shoe not purchased by the 6:00 p.m. deadline will be forfeited. Our customers are our priority and we encourage everyone to follow the procedures outlined above in an orderly and safe manner. We thank you in advance.